OK, I (melissa) am the only one who has been gone, but that meant no blog updates. 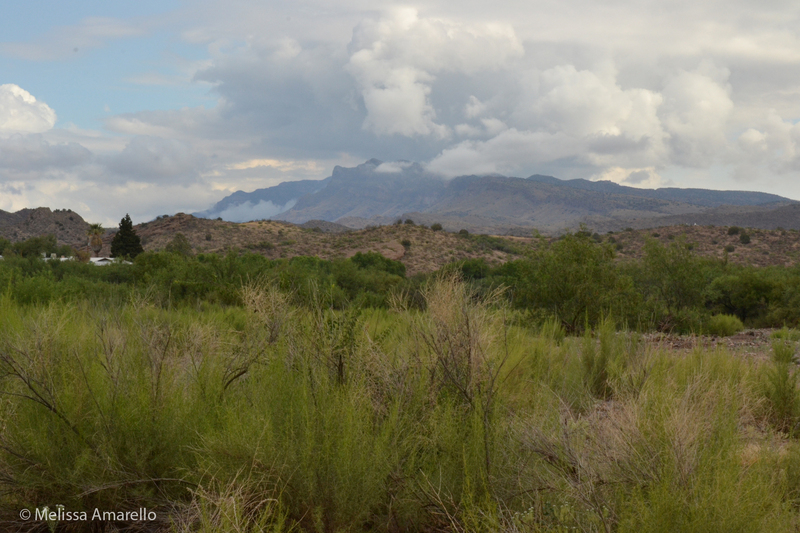 I’ve spent the last month finishing up fieldwork at our other project in central Arizona. And my how things changed at Muleshoe while I was gone! When I left, snakes were just starting to come out; now things are really hopping. Kay, a female black-tailed rattlesnake (Crotalus molossus), crawled into our lives at the end of March. Last fall we really wanted to find two black-tailed rattlesnakes for our study and would have REALLY loved to have a big, beautiful girl like Kay. But, Jaydin was the only one we encountered last year. Kay was crawling very near to where Jaydin was hanging out at the time, so maybe we’ll see the two of them together someday! 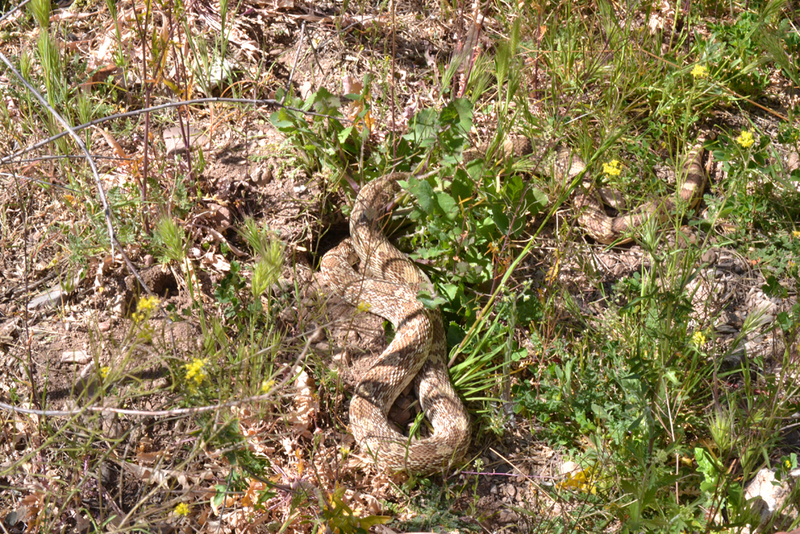 Henry, male western diamond-backed rattlesnake, 16 May 2012. 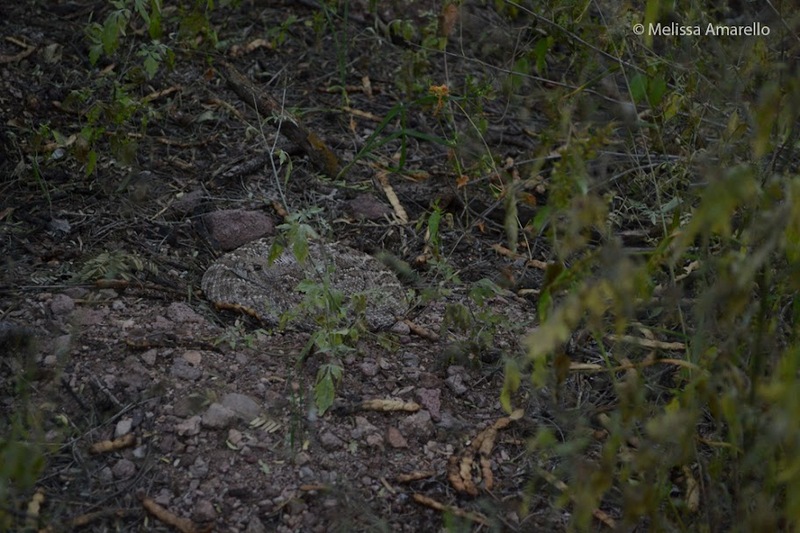 It took me a full week to locate Henry (male western diamond-backed rattlesnake). When Jeff last tracked him a few days before I got back, Henry was underneath a storage shed less than 100 feet from our house. He climbed up and over the hill behind Muleshoe Ranch Headquarters, only a 10 minute walk, but far enough to not be picked up by our telemetry gear. Sigh. At least we know where he is now. 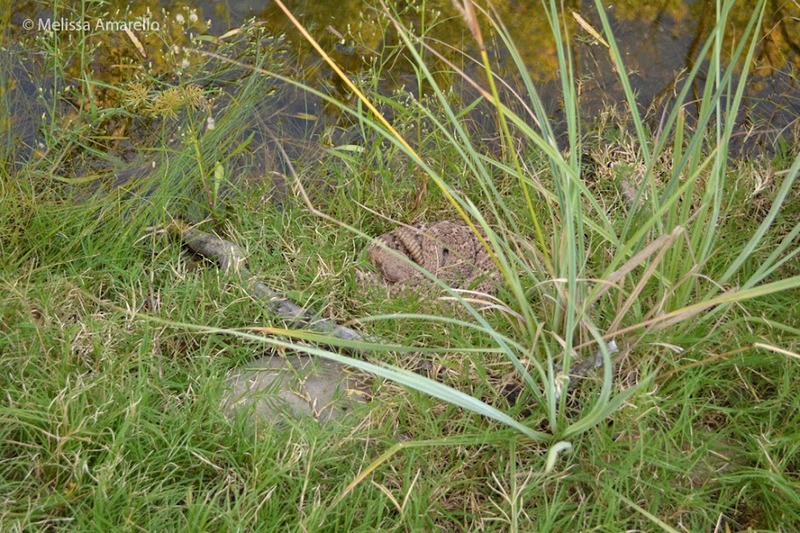 Stuart, male western diamond-backed rattlesnake, 13 May 2012. Ripley (horse) with Stuart at his feet (photo by Jeff Smith). 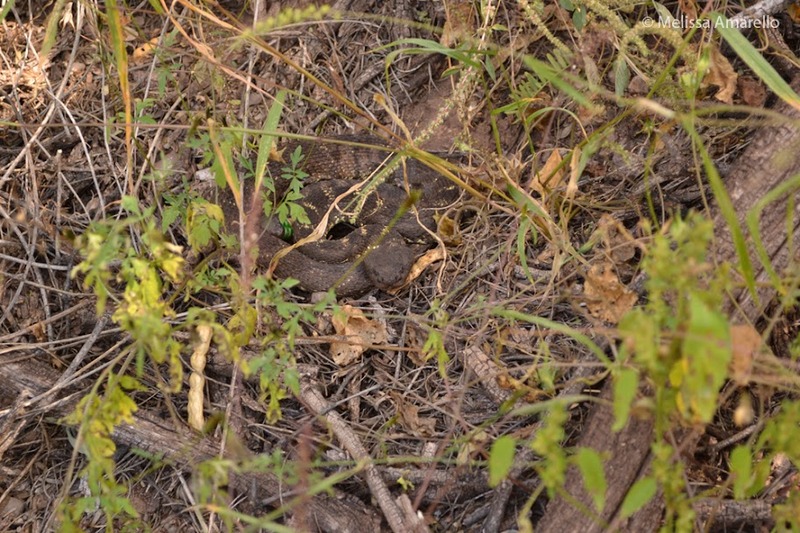 Jaydin, male black-tailed rattlesnake, 11 May 2012. When I tracked Jaydin (male black-tailed rattlesnake) earlier this week, he was hanging out in Hot Springs wash in the forest. This seemed like really easy tracking for Jaydin, so of course it didn’t last. He has since moved back toward his den, up into the scrubby hills. Chris, Arizona black rattlesnake, 11 May 2012. 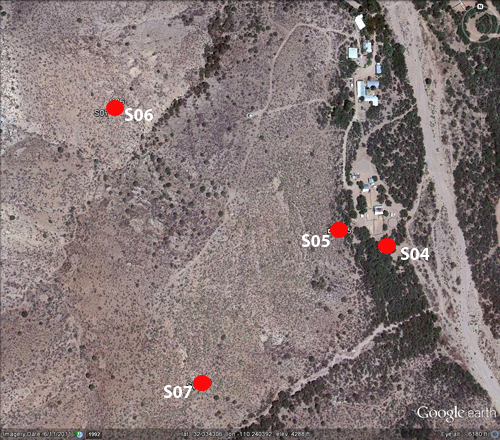 Chris (male Arizona black rattlesnake) has been moving around a lot, but sticking to Hot Springs wash or very near. When I last tracked him, he was cruising through some thick vegetation on the wash – mesquite bosque boundary. Boyett (male Arizona black rattlesnake) is the one snake who has not yet made it back to the area where we found him last fall. 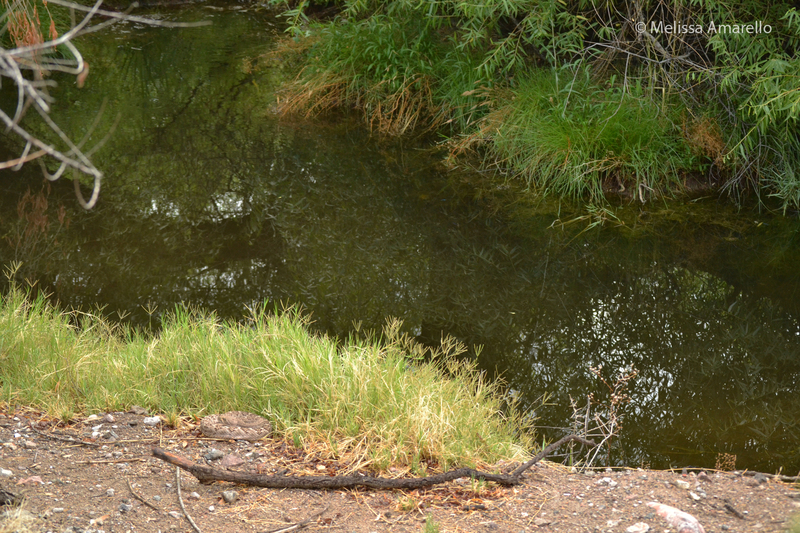 Instead he is using a drainage near Secret Springs (where he was found). The night I tracked him he was coiled in the open, sticking out like a sore thumb (pictured above). Glendy, male Arizona black rattlesnake, 10 May 2012. 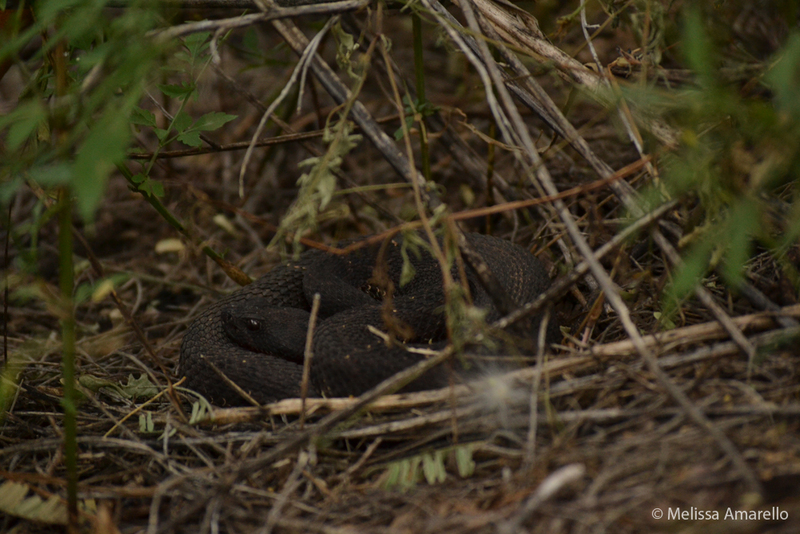 Glendy, male Arizona black rattlesnake, 17 May 2012. Both photos of Glendy have been corrected for differences in lighting, so the differences you see in color are real. This is a topic Jeff and I have been investigating for some time and hopefully we’ll have more to report on that here in the future. 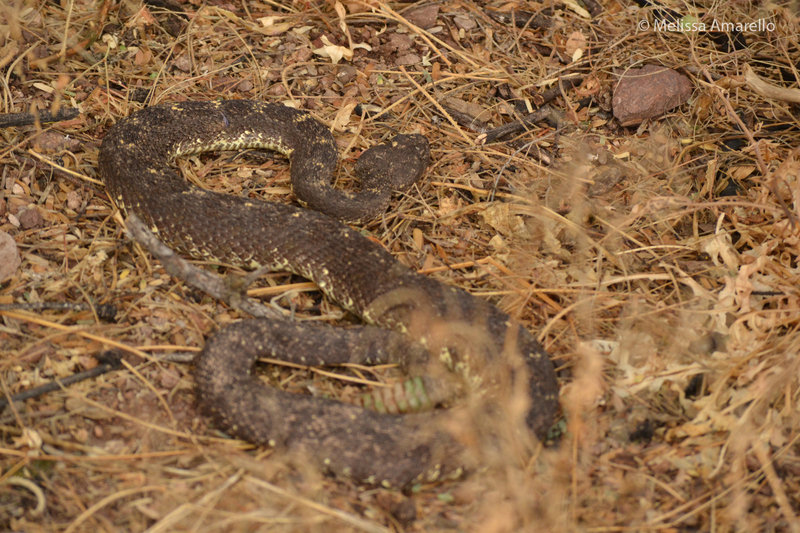 This week is the Center for Snake Conservation’s Snake Count. 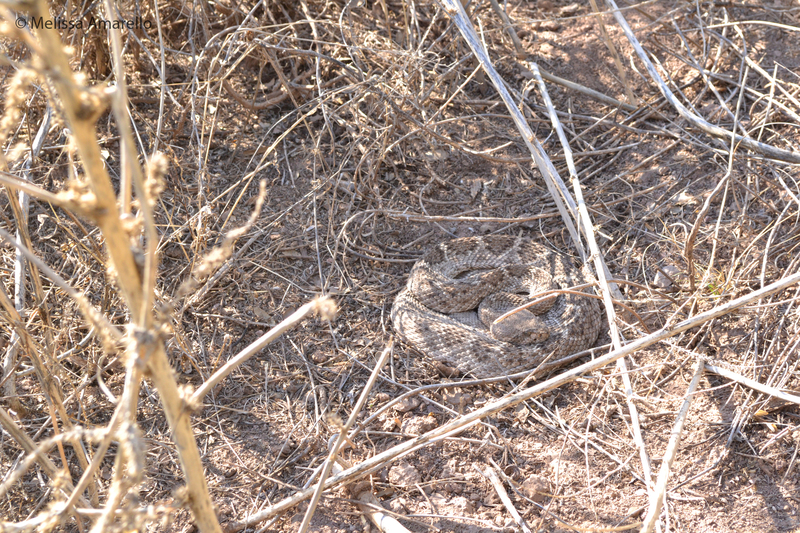 We have been keeping track of all the free-ranging snakes (everyone that doesn’t have a radio transmitter) encountered at Muleshoe and the next post will likely be a wrap-up of what we’ve found. 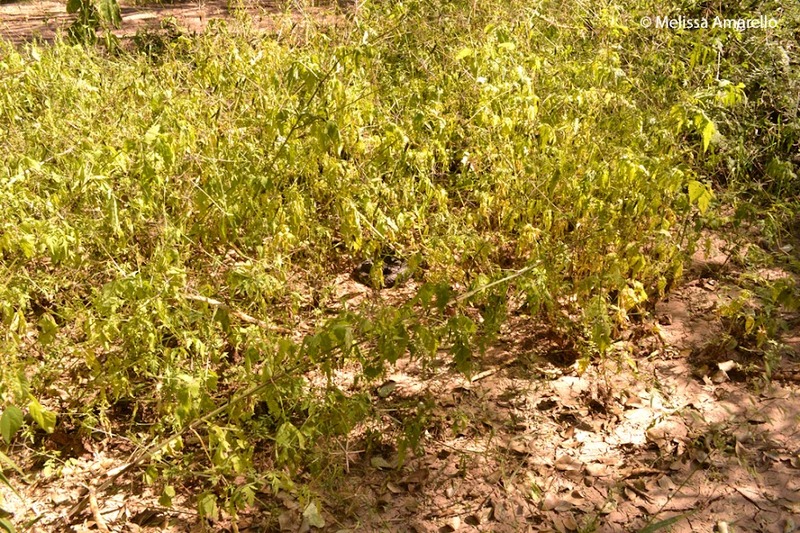 If you read this before 20 May – GET OUT AND COUNT SNAKES! Everyone can help! Visit the Snake Count website for more information. Or rather, has been here (I’m a little behind in posting :-)). 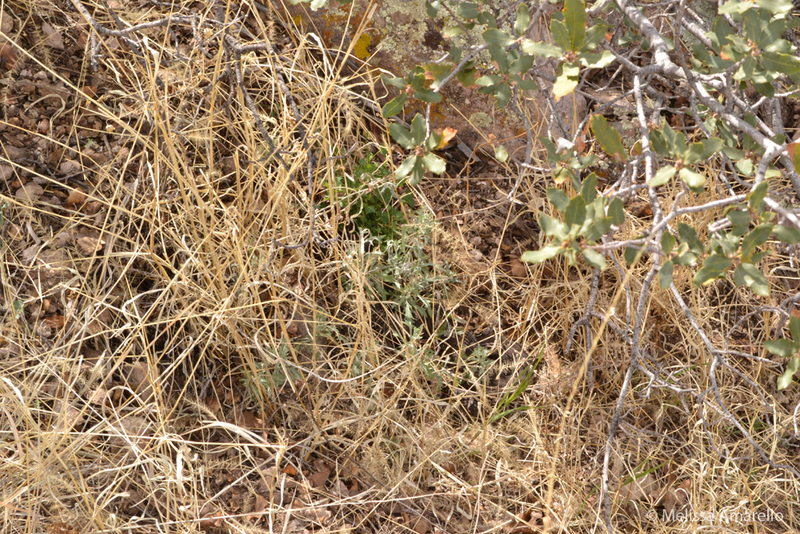 After many boring weeks of tracking our rattlesnakes and seeing almost nothing (we were sometimes able to glimpse a few inches of two of the Arizona black rattlesnakes), nearly all of them have now emerged from their dens. 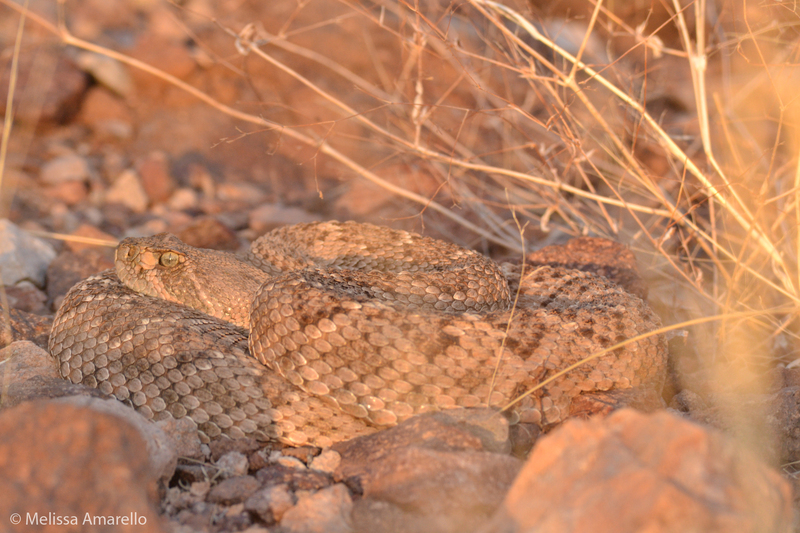 The first signs of spring arrived in mid-February, when the western diamond-backed rattlesnakes started basking just outside of their dens. 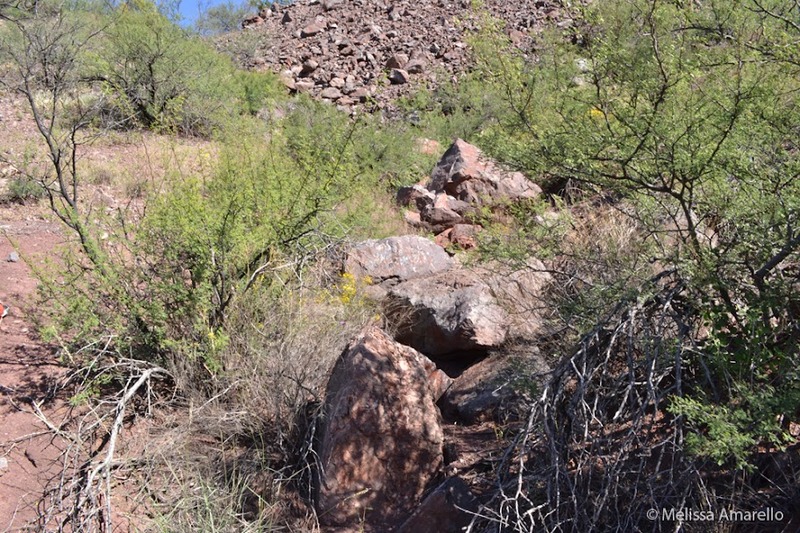 We’ve had remote timelapse cameras set up on Henry and Stuart’s den (male western diamond-backed rattlesnakes), Glendy’s den (male Arizona black rattlesnake), and two other dens (you can read more about one of those dens here and here). 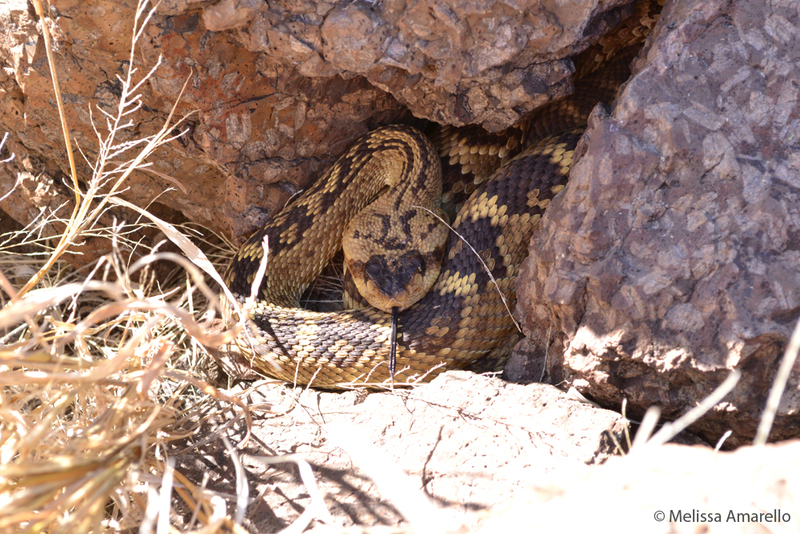 One of the new dens only had one occupant this year, a male western dimaond-backed rattlesnake we call Dwight. We finally had a snake to show interested visitors to Muleshoe, as he was reliably out basking, every day, all month (he’s now gone). Glendy, 17 February 2012 (click on photo for larger version, but he’s still difficult to see). 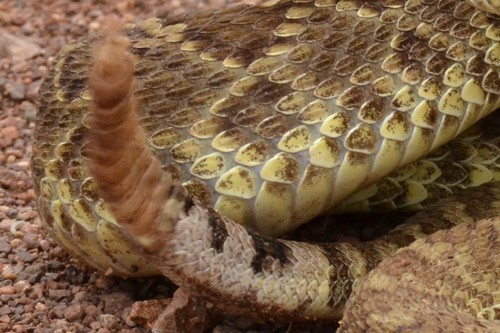 3 March: Of course Jaydin (male black-tailed rattlesnake) was the first to emerge – is anyone surprised? He was still a little sluggish, but looking beautiful sitting a few yards from his den. 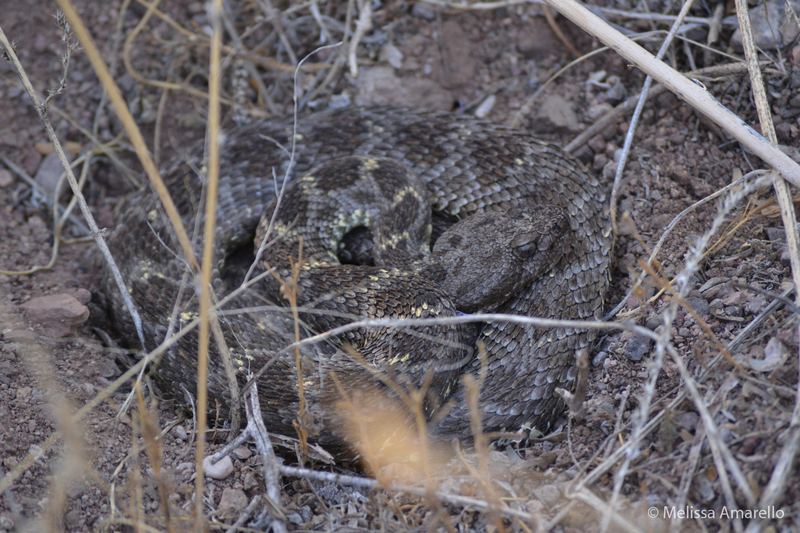 8 March: Stuart (male western diamond-backed rattlesnake) was the next to emerge from the den he shared with Henry (male western diamond-backed rattlesnake), a bee hive, and several other rattlesnakes (more on that in a future post). He has been resting underneath a rock downslope of the den ever since. Henry stayed inside until 29 March. 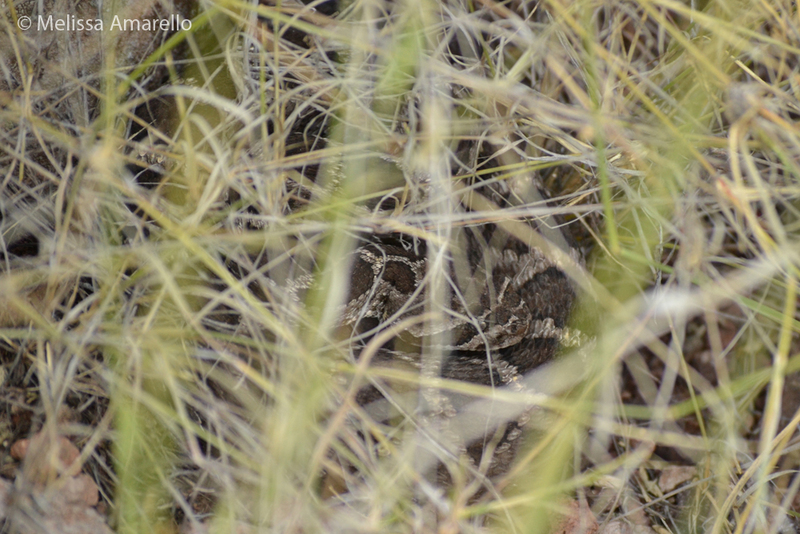 9 March: A female western diamond-backed rattlesnake showed up near the guest housing on the ranch. So snakes are now on the move… Allison will get her own post very soon. Allison, 11 March 2012, not at all happy to see us. 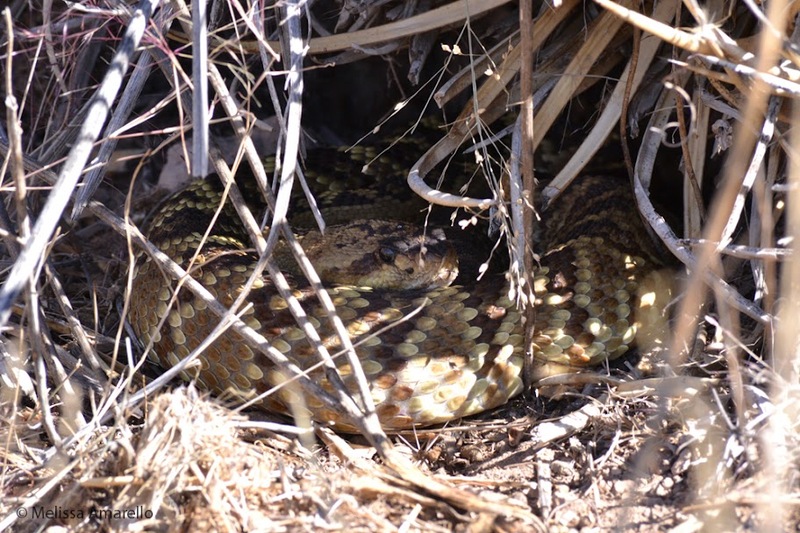 15 March: Our first yard snake of the year and it’s my favorite, a very large gophersnake! 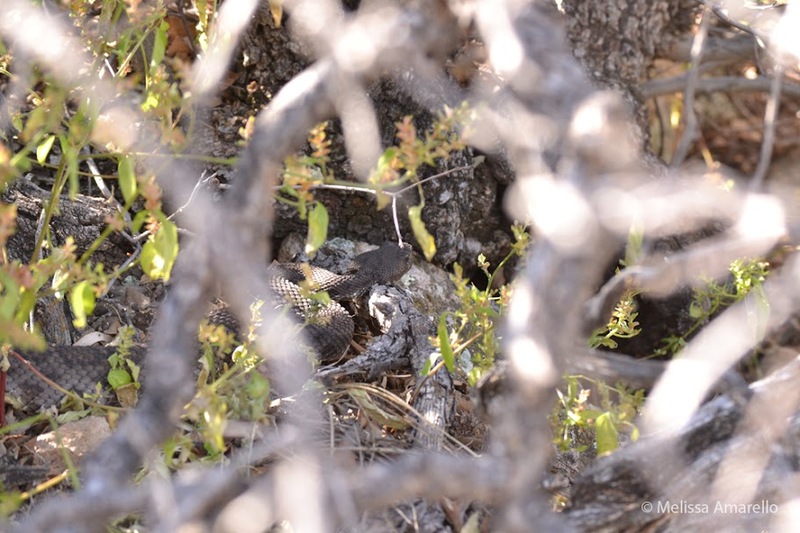 25 March: Boyett (male Arizona black rattlesnake) has emerged and was seen coiled beneath an oak tree just outside his den. Boyett, 25 March 2012. Who would have thought a jet black snake in yellow grass would be so hard to see? Boyett, 25 March 2012. Can you see him now? 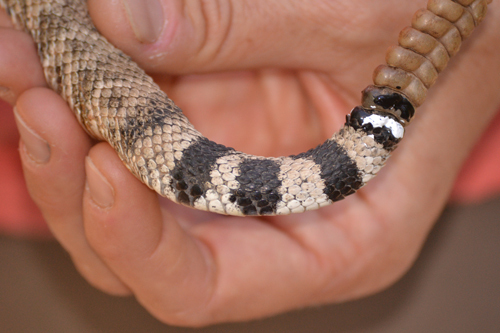 As of 30 March, Chris (male Arizona black rattlesnake) has not yet left his den. Interestingly, he was the first to arrive at his den (we haven’t seen him since 13 October) and will be the last to leave. 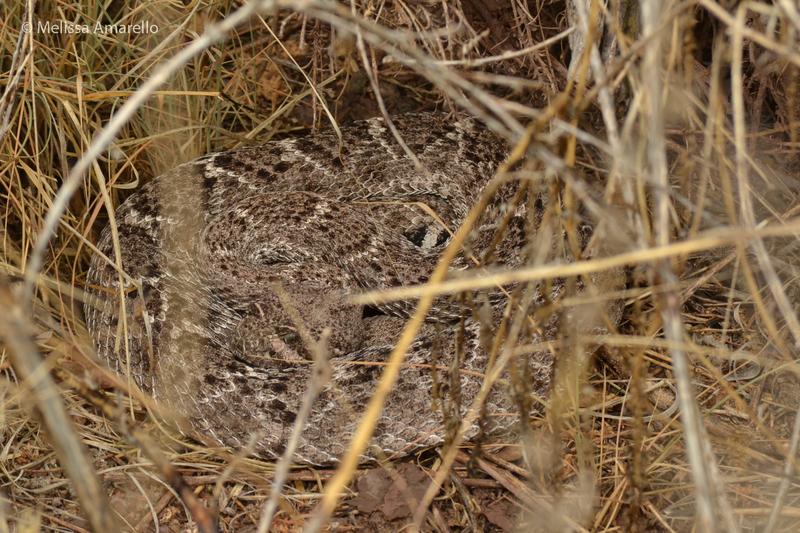 We will likely have news of his egress soon, social dens at Muleshoe, and (finally) some female rattlesnakes! December and January were pretty quiet here at the ranch; as you can see from the above photo, the weather has not exactly been snakey. OK, it only snowed a couple times and melted pretty quickly, but it has still been too cold for snake activity. 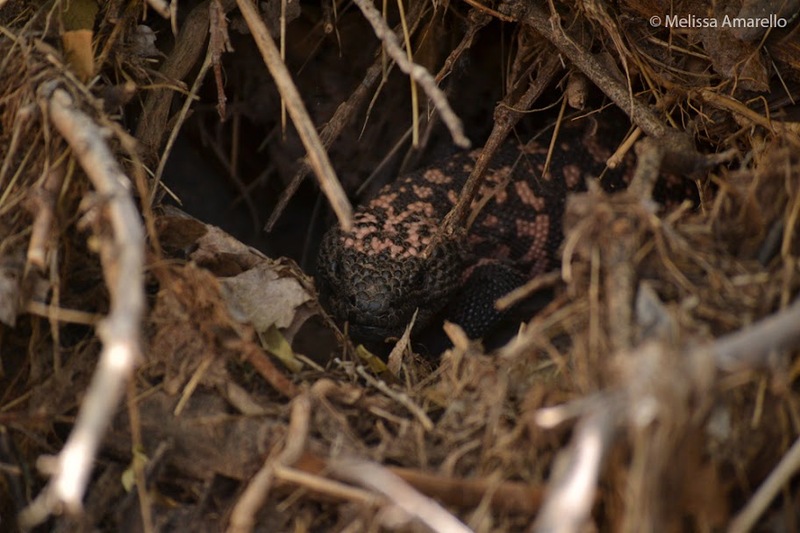 Even Jaydin (adult male black-tailed rattlesnake) finally settled into a den and has not moved since the end of November. 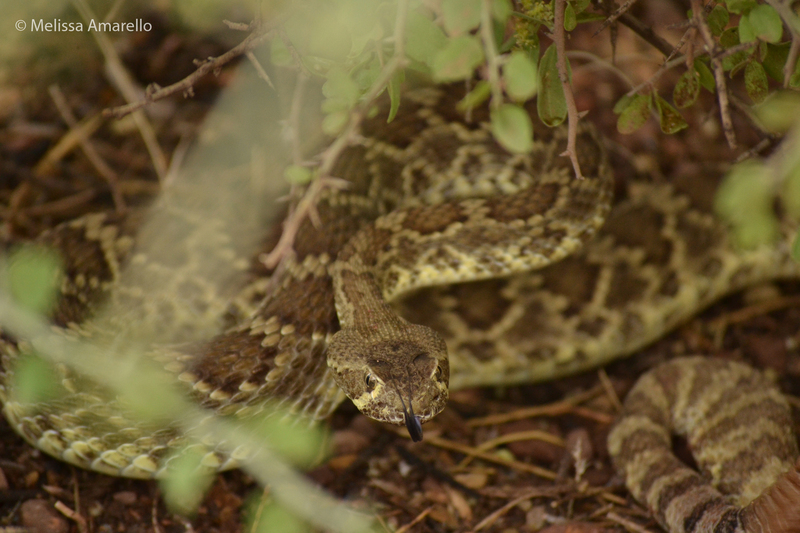 Although western diamond-backed rattlesnakes are known for their winter activity, neither Henry nor Stuart have peeked out of their den yet. We have a timelapse camera set up outside their den, and so far have only seen their bee neighbors coming and going. 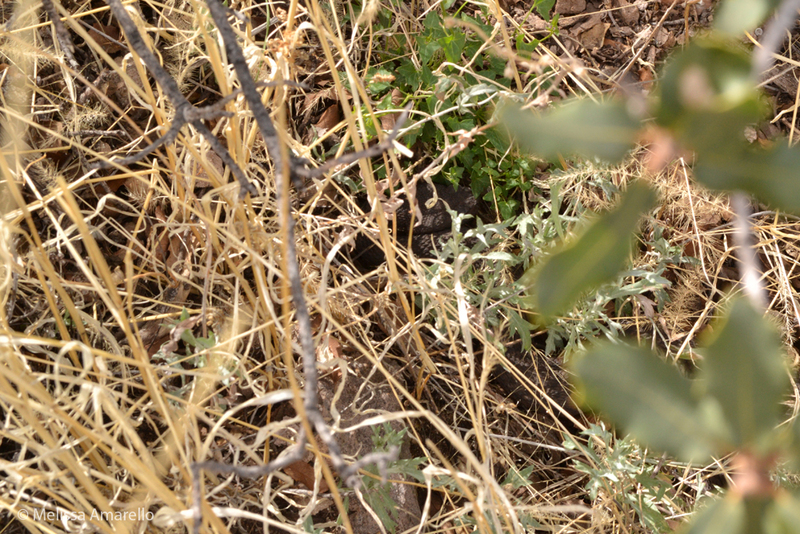 Chris (adult male Arizona black rattlesnake) has also not moved or been seen lately. 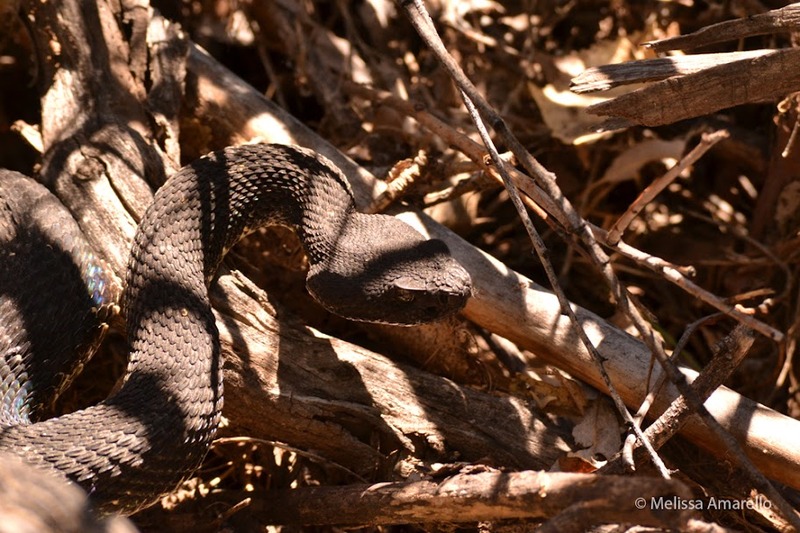 But we have good news: Jeff found Glendy, one of our lost Arizona black rattlesnakes! Turns out we were having problems with our equipment and Glendy hasn’t moved more than a few meters. 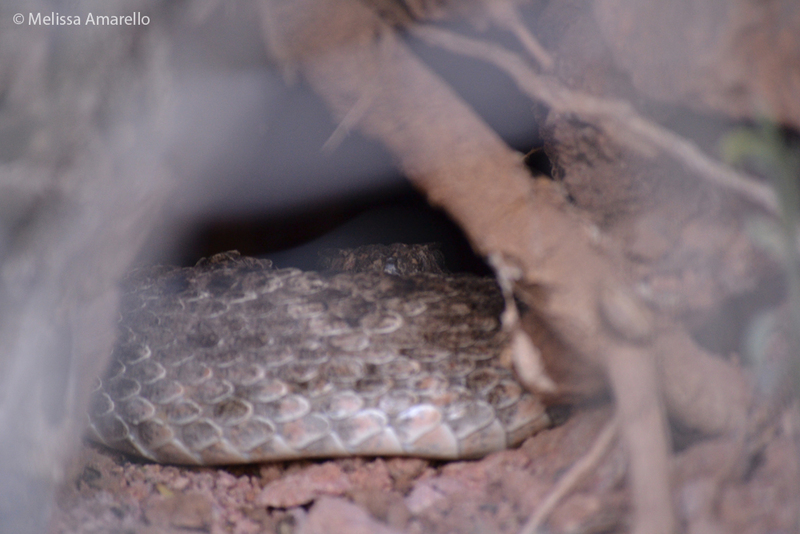 He is in a cave with at least one neighbor, probably a Sonoran whipsnake (Coluber bilineatus). We set a timelapse camera on their den, so hopefully we’ll have photos of both of them soon. 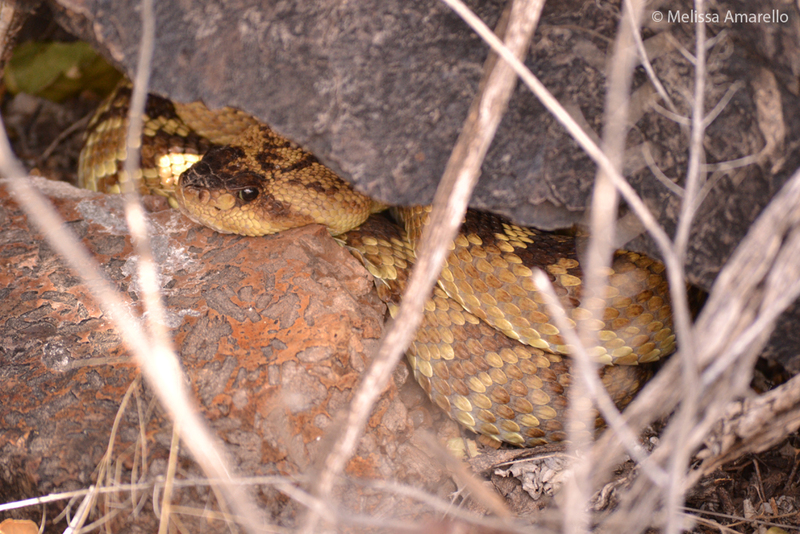 Surprisingly, the only other snake visible in its den is the remaining Arizona black rattlesnake, Boyett. This is surprising because I’ve never heard of anyone seeing this species in the winter, while sightings of western diamond-backed rattlesnakes are common. 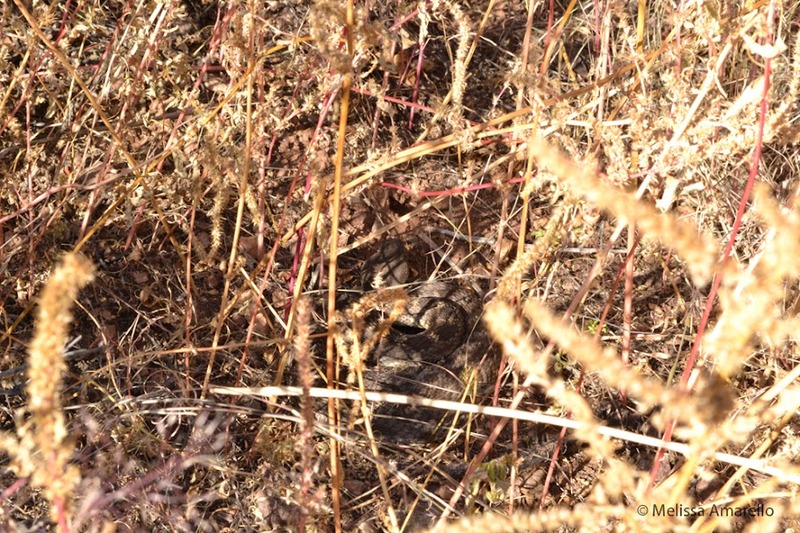 We are monitoring three diamond-backed dens and can’t see anyone, but can see two of our three Arizona black rattlesnakes. But that is one of the many things I love about snakes: we know so little, so we are always learning new and very cool stuff! A poor quality video of rattlesnakes drinking snow during the long, dry winter of 2005-2006. Not pictured here are the shin dagger, mesquite, acacia, and cacti that cover these hills. As I was unprepared for this hike, by the time I found Jaydin I was exhausted, but how can you be mad at this pretty face? After this big move, Jaydin stayed put for a little while. Weird!?! Not really, if you click on the above photo to view the full size image, you can see that his body is extended. Jaydin got himself a meal, which has slowed down his progress to wherever he’s heading. More fun with Jaydin next month! 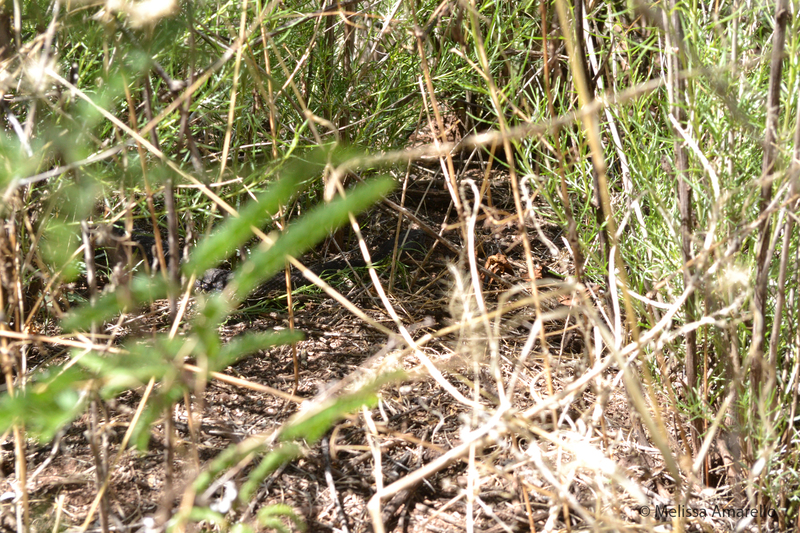 Jaydin’s former neighbor Boyett (male Arizona black rattlesnake) skirted along the hillside to face Hot Springs Wash and settled in the scrub there. Glendy crossed the road (again). He stayed in the mesquite forest between the road and the ranch for a few days before crossing the wash and settling into an amaranth patch. Because this spot is pretty close to our house, we checked on Glendy often over the next few days. He appeared to be trying to get a last meal in before going into his den. As we guessed, Chris had arrived at his den last time. From the boulder where we last tracked him, he went uphill into the talus and settled near some vegetation. While this spot certainly looks like it could house many rattlesnakes, we will likely have to wait until spring to find out if Chris has neighbors (we haven’t been able to see Chris since he entered the talus). Henry (male western diamond-backed rattlesnake) spent a few more days at the twin lakes before moving up on the hill above. He bounced around to several spots before settling into a hole at the base of a yucca. 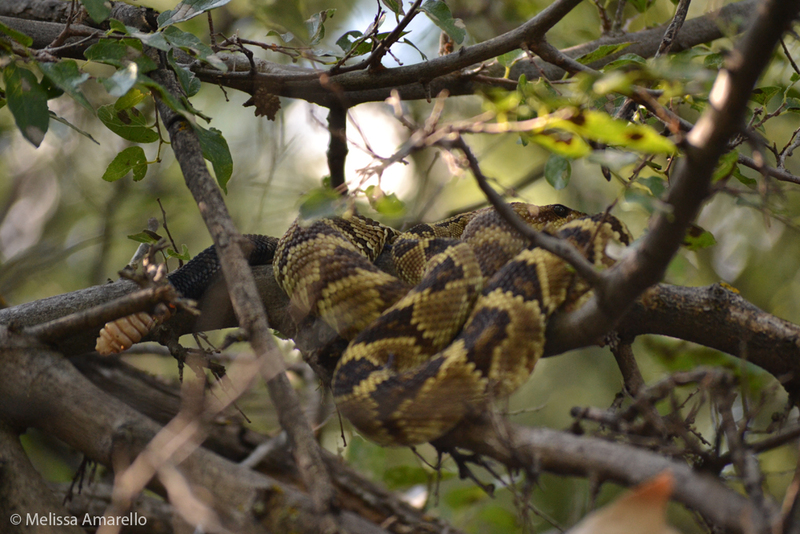 Stuart (male western diamond-backed rattlesnake) was trying to compete with Jaydin for being the biggest pain. He moved from his spot near the horse corrals (S04 on the map below) up onto the hill above (S05), not far from Henry. Then he moved to the north side of the hill above what we call Juniper Wash (S06). 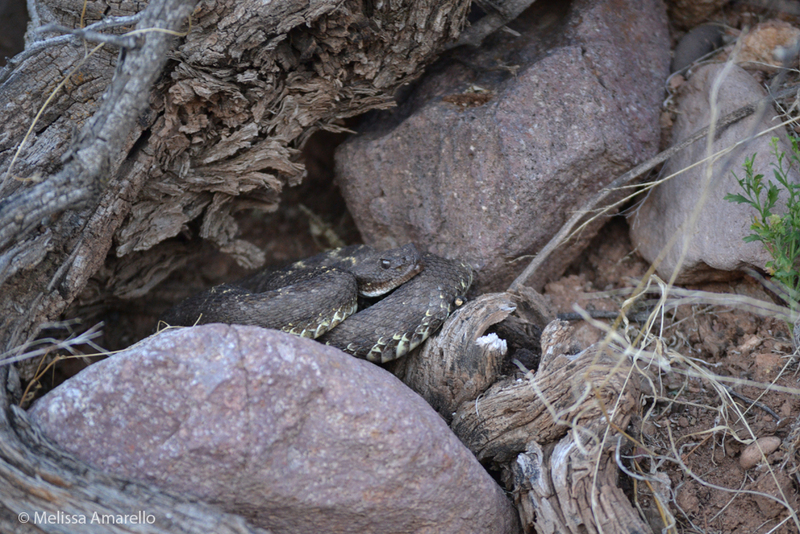 He stayed here all of one day before moving to the opposite side of the hill, into a patch of yucca (S07). On a somewhat sad note, we lost a snake this month. 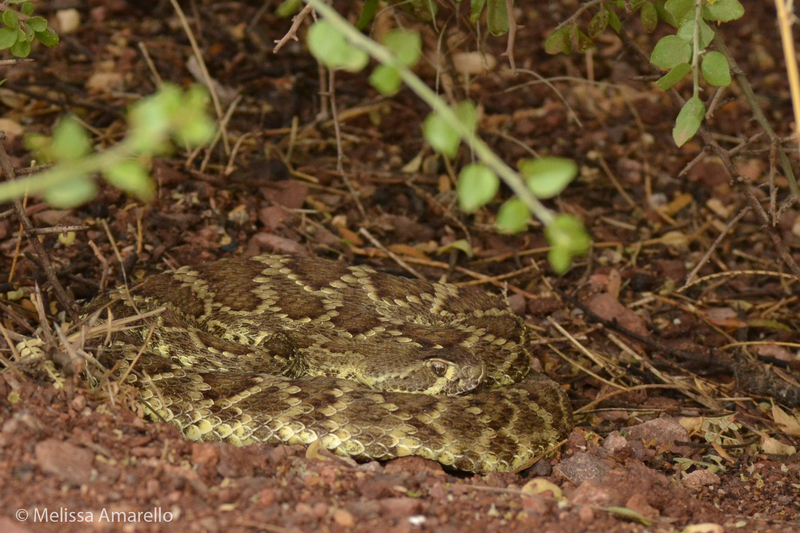 Barney, our other male Arizona black rattlesnake, was last seen on the side of road mid-October. We haven’t been able to get his signal since. We have had trouble tracking him since the beginning as there is loud interference at the same frequency as his radio transmitter. So he probably isn’t dead, he just finally moved far enough away that we can’t hear him over the interference noise. We’ll keep looking for him and expect to see him on the ranch next summer, if not sooner. The week began with a visit from our dear friend Roger Repp, who wanted to check out our new study site and track some of the snakes. We had barely started our hike down Hot Springs Wash when we came across a very healthy looking Sonoran whipsnake (Coluber bilineatus). As is typical with this species, it disappeared before we could get any pictures. October is not the best time of year for “herping” (looking for reptiles and amphibians) in Arizona, but Muleshoe breaks all the rules. 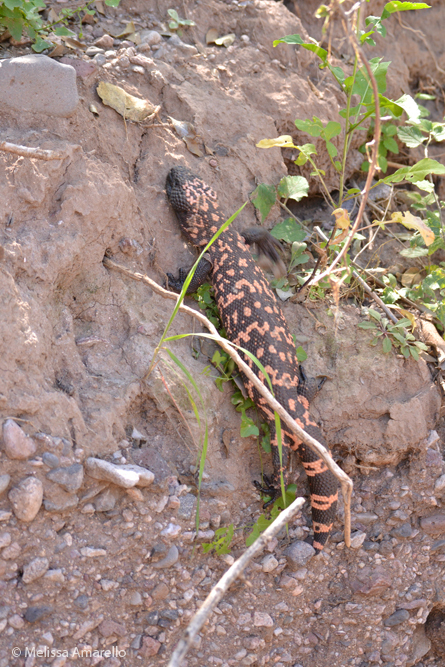 Our next find was something that is not typically active this time of year, a Gila monster (Heloderma suspectum). And he was very active, barely pausing long enough to give a decent photo. 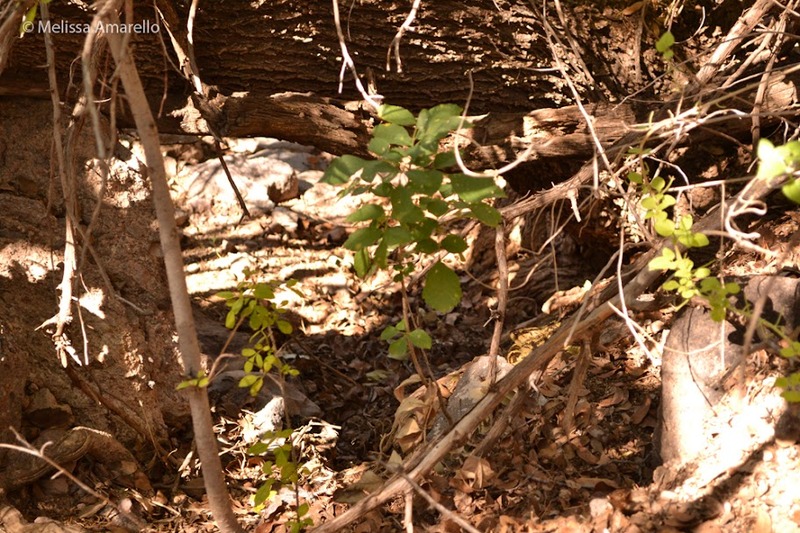 He finally found a hole beneath a mesquite tree and disappeared. Now it was time to find Chris! 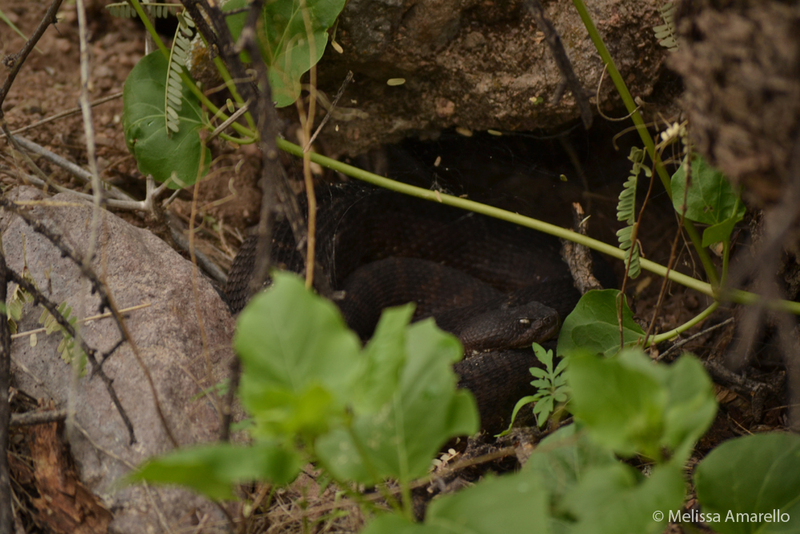 After some difficulty with our equipment, we located Chris (male Arizona black rattlesnake), who had moved downstream and was stretched out on a pile of branches and other debris piled up by this monsoon’s floods. Chris made a huge movement, out of Hot Springs Wash, across a mesquite forest, and ended up under the boulder in the foreground. 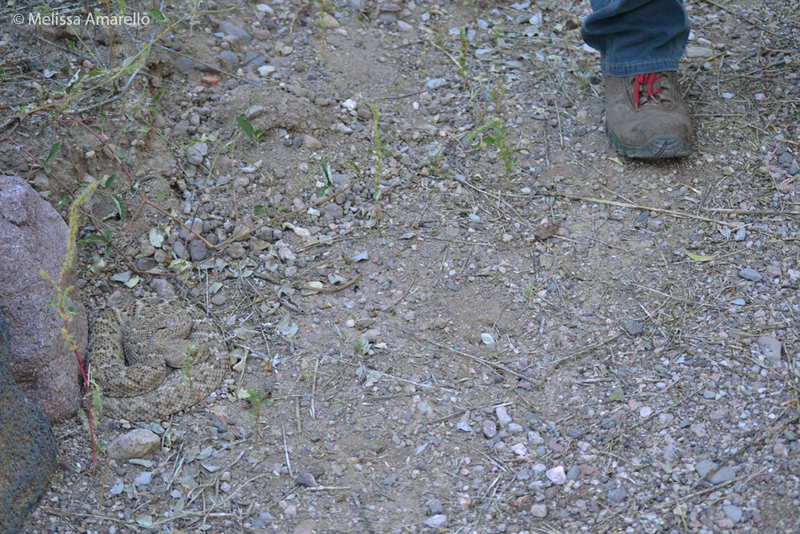 In the background is a large talus, a feature sometimes associated with rattlesnake dens. Has Chris arrived at his den site already? 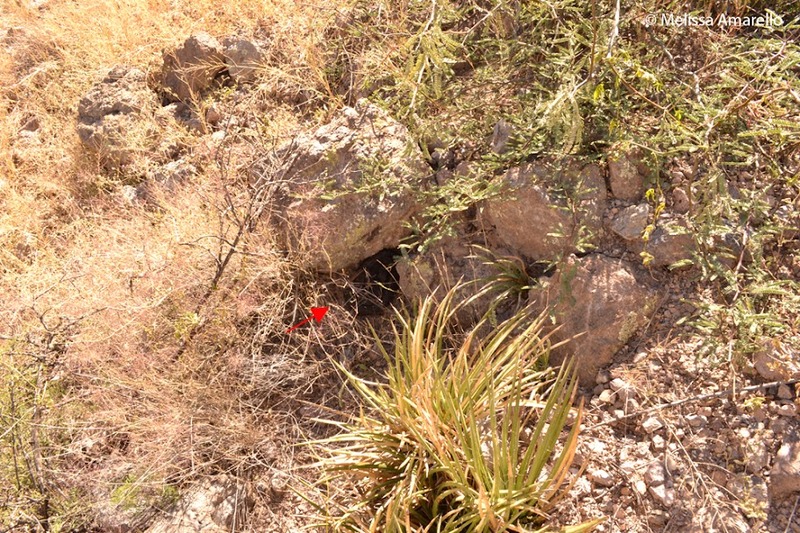 Boyett (male Arizona black rattlesnake) left Secret Springs and ended up on the grassy slope above, resting under a boulder (pictured above) and later beargrass. Glendy (male Arizona black rattlesnake) loves his mesquite forest. He crossed the road a couple times, but never moved very far, which is a good thing because telemetry is difficult in dense vegetation! The signal emitted by the transmitters implanted in the snakes bounces off trees, making it very hard to figure out where the snake is. I stepped within a meter of Glendy at this spot before I realized I had walked right past him! 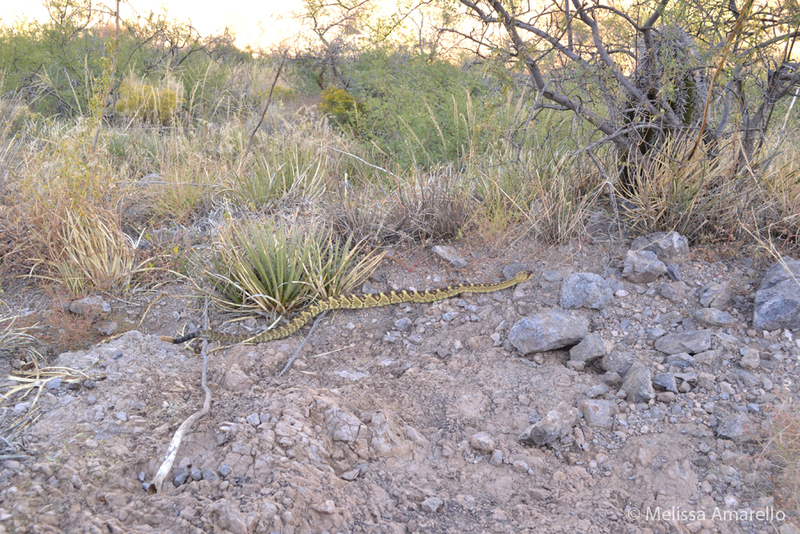 Barney (male Arizona black rattlesnake) also left Hot Springs Wash for the mesquite forest near the road. 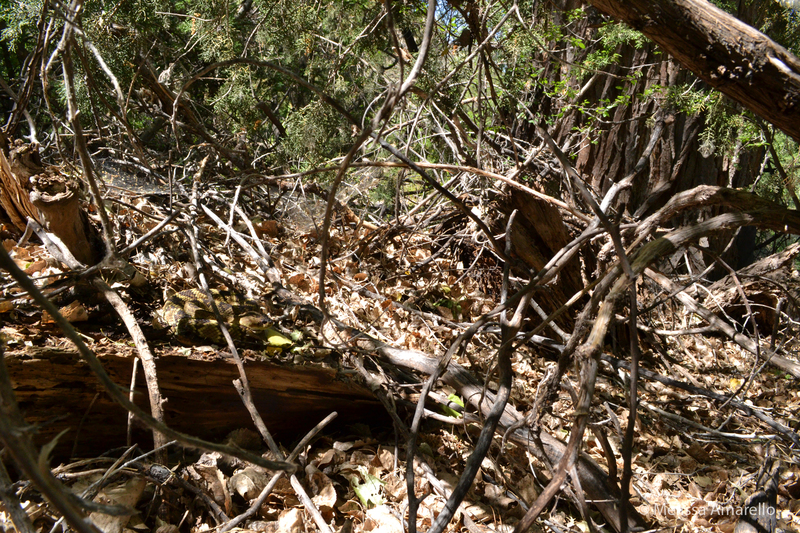 Dangerously near the road – you can see it in the upper left-hand corner of the photo. 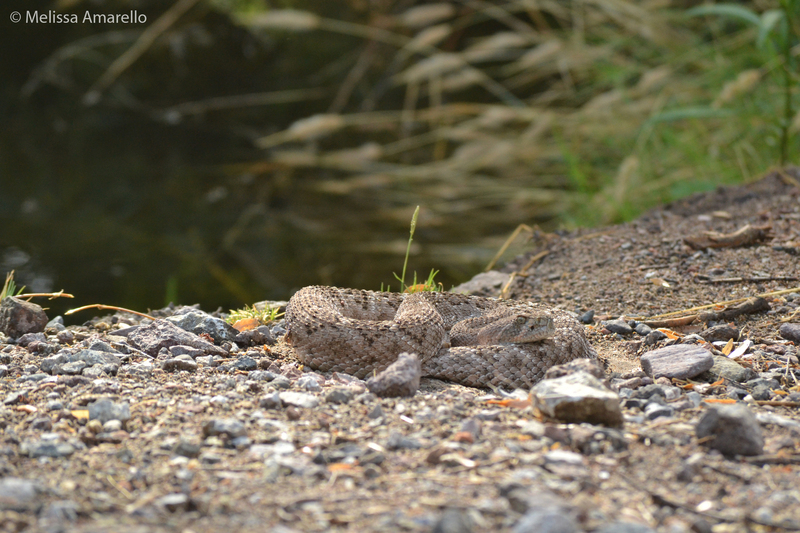 Henry (male western diamond-backed rattlesnake) spent a few more days near the casitas before moving up to the twin lakes – a pair of hot spring-fed ponds that are used to maintain native fish. There are also a ton of frogs in the ponds, which may be what attracted Henry. Stuart (male western diamond-backed rattlesnake) spent a couple days beneath an overturned horse trough at the spot where we saw a pair of courting western diamond-backeds on our first day. 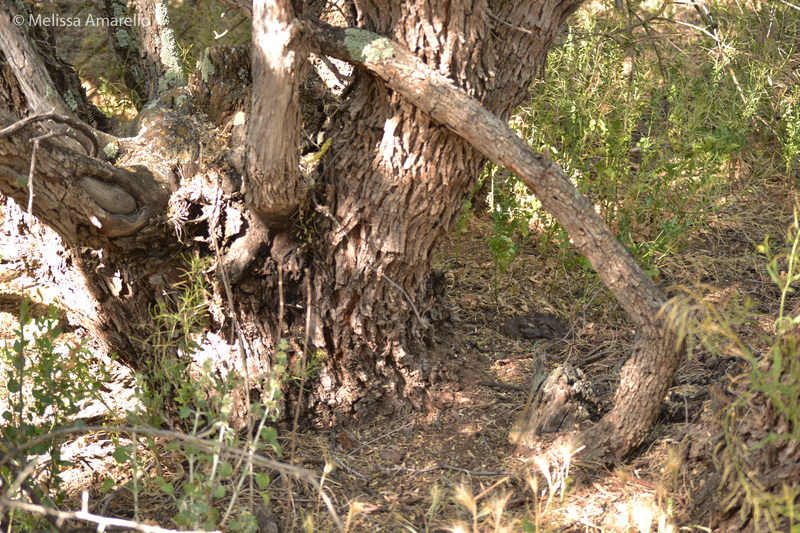 Then he settled under a mesquite tree near the horse corral.